Afghanistan Currency was redone in 2002. It has generally held its value of 50Afs/$1 (U.S.) since that time. Need a Different Currency? Use the form below! Credit cards are accepted at the Serena Hotel in Kabul. There is an ATM at the Intercontinental Hotel as well as the Kabul City Center Mall. It is dangerous to use an ATM, as they may be watched by criminals. Make sure you have a driver waiting and take precautions. Afghan banks are still not issuing credit cards to their bank holders. It is not recommended at this time to use an Afghan bank. However, if you must, the typical hours enshalla are: Sat-Wed 0800-1200 and 1300-1630, Thurs 0800-1330. Sometimes the banks may stay open until 1pm, and not open until after 2pm. For reference, one piece of local nan is 8 Afs. We commonly purchase sugar for 35 Afs/kilo. 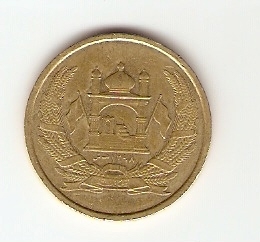 The correct name for the Afghanistan currency is "Afghani." The coins are also Afghani. A person from Afghanistan is called an "Afghan." This is a common cultural mistake made by foreigners when these two terms are incorrectly applied. 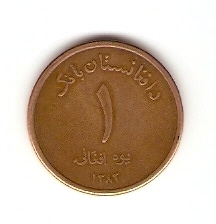 It is common to hear an Afghan use the word "rupee" when referring to Afghanistan currency. This is NOT to be confused with the Pakistani rupee. 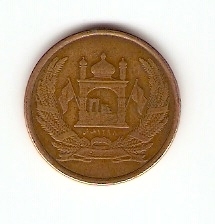 Until 1925, Afghanistan currency used to be called the "Afghan Rupee." The following Afghanistan currency pictures are the current list of denominations and explanation of pictures on each coin and bill being used. The descriptions of Afghanistan currency came straight from Afghan personnel working in the Kabul Bank. Below are pictures of each denomination of Afghanistan currency with the appropriate description under each image. 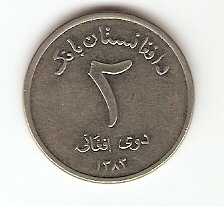 The 5 Af coin - The Dari number for "5" on the left side and the Afghanistan National Emblem on the right. 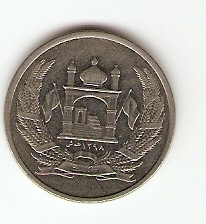 The 2 Af coin - The Dari number for "2" on the left side and the Afghanistan National Emblem on the right. 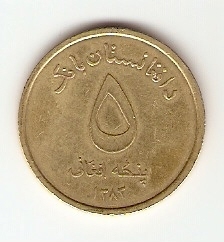 The 1 Af coin - The Dari number for "1" on the left side and the Afghanistan National Emblem on the right.